Waking up to your loved one on Valentine’s morning is one of the most special feelings in the world, especially when they are handing you a delicious breakfast plate. Start the day relaxed, and warm next to each other. Feed each other, and then kiss each other. Being surprised and showered with gifts is something that leaves you feeling giddy, without comparison. Wrap up a box of chocolates, put freshly cut flowers in a vase or sprinkle rose petals leading to the bed for an extra bit of romance. #3 A Handwritten Love Letter. Unfolding a letter with carefully handwritten words, that have been thought out and inspired by your partner is one of the sweetest gifts you could ask for. Find some nice paper, and a fineliner, and write out a special message. It’s pretty unforgettable. Treat yourself to a luxury massage for you and your partner, or if you are feeling adventurous, grab some body oil and give a sensuous massage to each other at home. This is sure to get you feeling relaxed and excited for the night ahead. Spoil your loved one to a candlelit dinner, over a delicious three course meal, to really make them feel appreciated. Include aphrodisiac foods in the menu to increase the sensual feel of the night. Check out this (blog post) to see what these stimulating foods are, and then have a look at our (menu) to plan your romantic evening. Walk along the beach, or sit atop a rooftop, and watch the sun go down over some bubbly and soft kisses. There is nothing more movie-worthy than a magical kiss with a beautiful view. After a romantic dinner date, go home and relax to a famous Valentine’s movie. Some of our favourites are: “When Harry Met Sally,” “Pretty Woman,” and “Crazy Stupid Love.” Grab a blanket, slip into something more comfortable and cuddle up. Valentine’s Day is all about romance, love and passion – and what better way to show that than through food. Here are a list of Aphrodisiacs to make your special someone feel the love this Valentine’s. 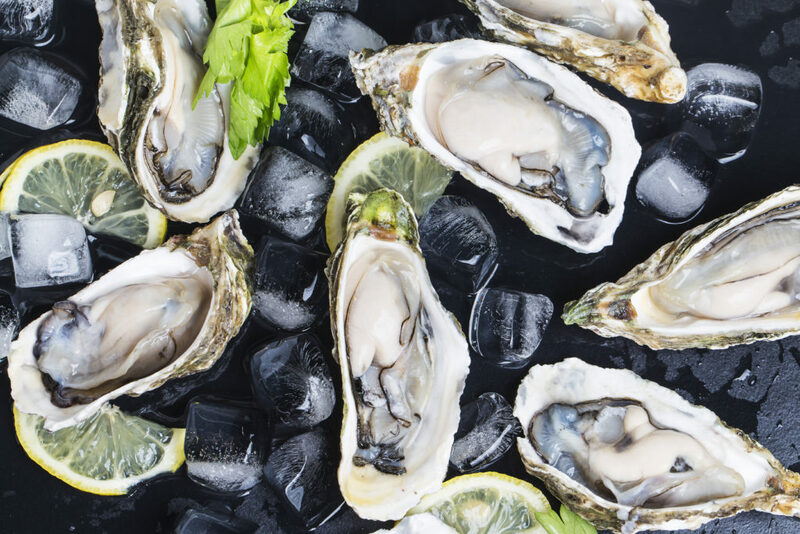 High in zinc, these aphrodisiacs of the ocean are reputable for stimulating love and fertility. This invigorating spice, bright red and exotic, may easily be considered a symbol of love. Chilli stimulates endorphins – the feel good chemicals found in your brain – that speeds up heart rate, and makes things get a little heated. This rich fruit is sensuous and delicious, with an aphrodisiac reputation dating as far back as the Aztecs. High levels of vitamin E maintain a youthful energy level, which ensures the spark is kept burning bright. From the delicate, rich taste of chocolate to it’s luscious aroma, the heavenly treat is known to be sensual. Dark chocolate is especially shown to spike dopamine levels, increasing the feelings of pleasure. Phallic shaped, the banana suggests itself to be a feel-good food. They also contain enzymes which triggers testosterone production, while elevating energy levels with their potassium and vitamin B.
Honey is created through the process of pollination, which is a symbol of procreation. Have you heard of the birds and the bees? Honey also contains boron, regulating estrogen and testosterone levels, and providing a natural energy boost. The main ingredient in coffee is caffeine, the stimulant that makes the heart pump faster and the blood flow. It’s,also been said that coffee can put women in the mood. A good source of monounsaturated and polyunsaturated fats, Olive Oil is a critical source for a healthy heart, the production of hormones and keeps the blood flowing. The Greeks even believed that Olive Oil made men more virile. Strawberries are a delicious vitamin C-packed dessert that keeps the blood flowing in all regions of the body. Best served dipped in chocolate and fed to your lover. There may be no evidence that this indulgent dessert topping will increase libido, however there is no denying that it is sure to put you in the mood.